A late goal from Iain Flannigan secured Alloa Athletic a home win over Scottish Championship strugglers Hibernian. Midfielder Jason Cummings headed the visitors in front when he met Sam Stanton's corner on the quarter-hour mark. Liam Buchanan drew Allow level when he smashed into the roof of the net after an initial good save by Mark Oxley. 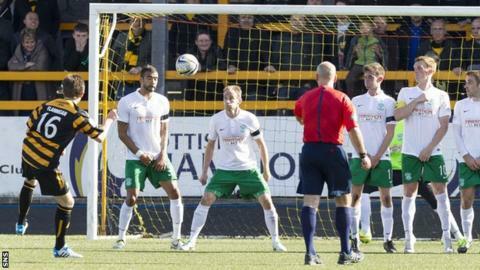 Jordon Forster's volley sailed just over the bar before Flannigan's free-kick gave the Wasps all three points. Match ends, Alloa Athletic 2, Hibernian 1. Second Half ends, Alloa Athletic 2, Hibernian 1. Michael Doyle (Alloa Athletic) wins a free kick in the attacking half. Substitution, Alloa Athletic. Steven Hetherington replaces Liam Buchanan. Attempt missed. Greig Spence (Alloa Athletic) left footed shot from a difficult angle on the left is just a bit too high. Corner, Alloa Athletic. Conceded by Jordan Forster. Attempt saved. Paul Heffernan (Hibernian) right footed shot from the centre of the box is saved in the centre of the goal. Goal! Alloa Athletic 2, Hibernian 1. Iain Flannigan (Alloa Athletic) right footed shot from outside the box to the top right corner following a set piece situation. Substitution, Alloa Athletic. Iain Flannigan replaces Stephen Simmons. Attempt missed. Liam Buchanan (Alloa Athletic) right footed shot from the right side of the box is close, but misses to the right. Paul Heffernan (Hibernian) wins a free kick in the attacking half. Attempt saved. Alex Harris (Hibernian) left footed shot from outside the box is saved in the bottom left corner. Attempt missed. Samuel Stanton (Hibernian) right footed shot from the right side of the six yard box is close, but misses to the right. Corner, Alloa Athletic. Conceded by David Gray. Attempt missed. Jordan Forster (Hibernian) right footed shot from the left side of the box is just a bit too high. Corner, Alloa Athletic. Conceded by Scott Allan. Substitution, Hibernian. Alex Harris replaces Matthew Kennedy. Hand ball by Liam Buchanan (Alloa Athletic).